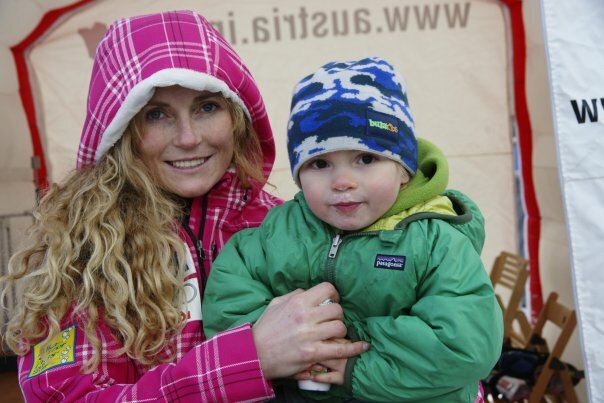 Schleper spent 2008 welcoming her son, Lasse (born Jan. 2008), into the world with husband Federico Gaxiola. Now the hardest working mommy on snow, she rocketed back into incredible skiing shape. Sarah believes if women are to have a career and a family, there is no need to sacrifice family time. Now full-time with family in tow, Team Schleper-Gaxiola travel together throughout the season. She’s become an important role model to career moms and kids today. Sarah proof you don’t have to make a choice between being a stay-at-home mom or having a successful career. “We will never lose the true value of family-togetherness both on the hill and off” says Sarah. Sarah Schleper is four-time Olympian and FIS Alpine Ski World Cup win. Schleper is a force to reckon with in FIS Alpine Ski World Cup circuit. Sarah is off to a great start for the 2010/ ‘11 season as she has two first place finishes proving to be a fierce competitor this year. After topping the podium at the Nor-AM opening slalom, Sarah is off to Europe with confidence and momentum setting up for a potential outstanding year. Schleper had the best time in both runs, rolling to her second win in the young season. She won a FIS race earlier in November in Copper Mountain. Sarah asserted a stunning comeback this past two season earning enough points to earn her a fourth trip to the Olympic Winter Games in Canada representing the United States. Sarah has been atop World Cup podiums with an FIS World Cup win, she won the U.S. championships and has competed in four Olympic Games during her exciting career . This year Sarah is showing improvement in all disciplines with two first place top of the podium wins! Sarah Schleper is seeking sponsors to assist her in the coming months and the coming years. "I am truly committed traditional family values, motherhood, and terrific athlete. Consider me as an ambassador and representative for your company." Copyright 2010 Sarah Schleper-Gaxiola. All rights reserved.